Some of the biggest names in folk and blues music might never have made it without Folkways, a studio that gathered some of the most influential talent ever recorded. Worlds of Sound explores the powerful chords of this musical inheritance. With longtime Folkways producer Richard Carlin and others, the film takes viewers through the Folkways story, from the passion of founder Moses Asch to the New York Jazz scene in the 1940s, to the 60s counter-culture and its folk heroes. The film introduces us afresh to Woody Guthrie, Pete Seeger and others at the front of the Blues and Folk revivals: names like Lead Belly, Sonny Terry, Brownie McGee, and Lightnin’ Hopkins. Folkways recorded everything: the clatter of city street noises, the murmuring of frogs, and the music of distant lands unknown to most Americans — and way off Top 40. For this sweeping story, we venture inside Smithsonian Folkways and meet the people who continue to discover and collect music from around the world. “Our songs are singing history,” Woody Guthrie declared. 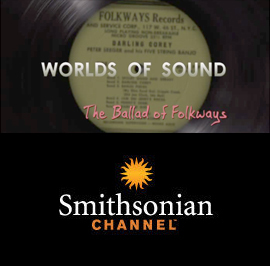 This documentary reveals how true this is through the songs of Folkways artists.